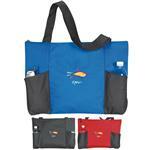 Meeting, convention and trade show tote bags for every budget, just call 888-332-ADCO and stop surfing around! Our USA staff experts are ready to help! 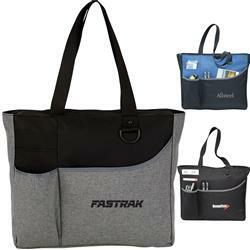 The main compartment of this sturdy tote zippers shut to secure items when on the go. Multiple pockets and a D-ring on the front allow for easy storage of cell phones, pens, keys, business cards, and water bottles. 11" handle drop height. 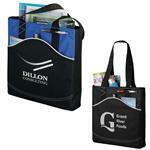 Custom tote bags work for many events such as tradeshows, employee awards and more. 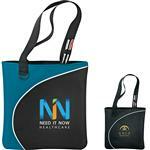 One of our best selling trade show tote bags! Dimensions: H 13" x W 3.5" x L 15"
Typical Imprint Area(s): Screen Prints: Centered on large R. pocket L 4" x H 4"
Centered on small L. pocket L 2" x H 2"
Available Imprint Options: Screen, Embroidery, Full Color Imprint and Epoxy Dome. Materials: 600d PC. Meeting tote bag. 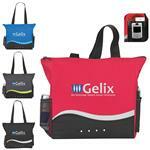 Great for tradeshows, conventions, and business meetings. Zippered main compartment. D-ring and multiple front pockets. 11" handle drop height. Carton size H 11" x W 15" x L 19"
Carton pack 48 pieces, Carton weight 30 lbs.